I love using a spray gun for finishing. It produces a smooth, even finish in a fraction of the time it takes with a brush. The only downside is the clean up. It's messy and time consuming, especially when you're spraying a solvent-based finish. Plus, the fumes can be dangerous. To deal with the clean up, I made a special clean-up can just for my spray gun out of an old 3-lb. coffee can and a cabinet handle (see Drawings). Simply cut a hole in the plastic lid for the end of your spray nozzle. 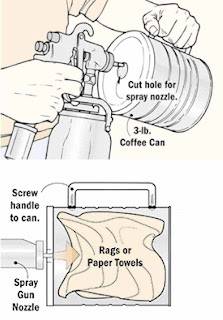 Then fill the can with rags or paper towels to absorb the finish and thinner that's sprayed out when cleaning the gun. 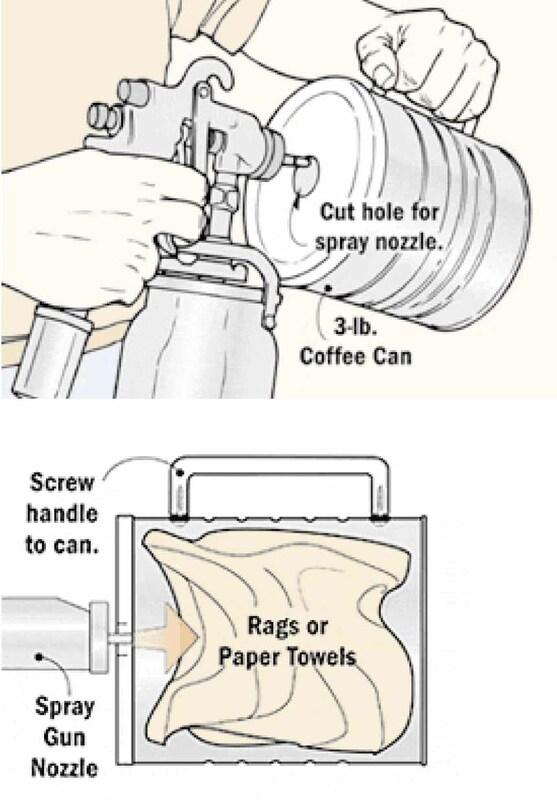 Note: Be sure to take the rags out of the can and let them air dry in a well-ventilated area before you dispose of them.